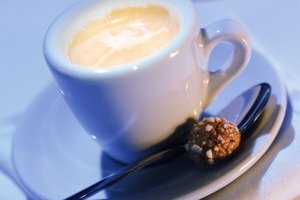 A sweet, rich candy made from heated sugar, caramel's buttery flavor lends itself beautifully to coffee and is a must-have flavoring at any coffee shop, particularly for cappuccinos and lattes. Lattes combine espresso and milk with flavorings like vanilla, caramel and chocolate to produce classy, creamy coffee beverages that serve to add a little flavor to the average morning coffee routine. Using an all-in-one coffee machine with a steaming wand or a quick stove-top method and a few simple ingredients, you can make these decadent drinks at home for a fraction of the cost of their coffeehouse counterparts. Brew the espresso or coffee of your choice. If you cannot brew espresso, you may use a bold coffee. 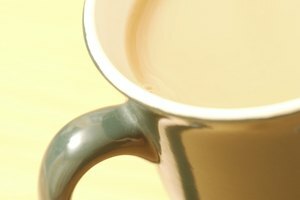 Ensure that the coffee is strong and bold, as the milk will overpower the flavor of a weaker coffee. Pour the espresso or coffee into a mug and add the caramel syrup. Froth the milk using the steaming wand, holding the milk at an angle and letting the wand dip into the top. Steaming wands inject at the surface of the milk where they both heat and aerate it, giving it a light, whipped consistency and producing a layer of foam on the top of the milk. Milk should be as cold as possible before being frothed. Add the frothed milk to the coffee and spoon the foam on top of the milk onto the top of the coffee. Garnish the latte with caramel syrup or cinnammon. Do not stir the latte. Serve immediately. Pour the milk into a medium saucepan. Set the burner to a medium to medium-high heat. Stir the milk slowly with the whisk, increasing the speed at which you stir as the milk becomes hotter. Allow the bubbles to form in the milk. The more you whisk the milk, the more condensed the bubbles and thus, the frothier the milk will become. Increase the whipping speed. Whisk the milk as though beating an egg or use an electric handheld mixer for faster results. The increase in speed will cause the milk's consistency to change. 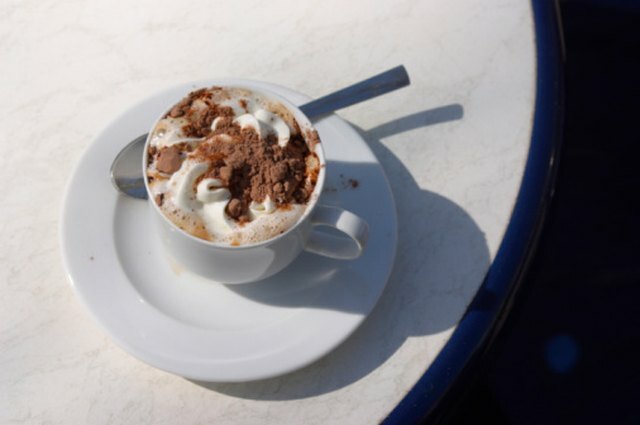 Do not allow the milk to boil as this will change the consistency you are looking for -- a consistency like that of whipped cream -- as well as ruin the foam. Whisk the milk until it is completely aerated and doubles in volume. The frothed milk will be beneath the foam and may be used in the same manner as stated above. 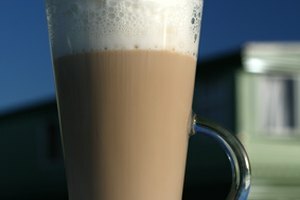 Can You Froth Soy Milk?